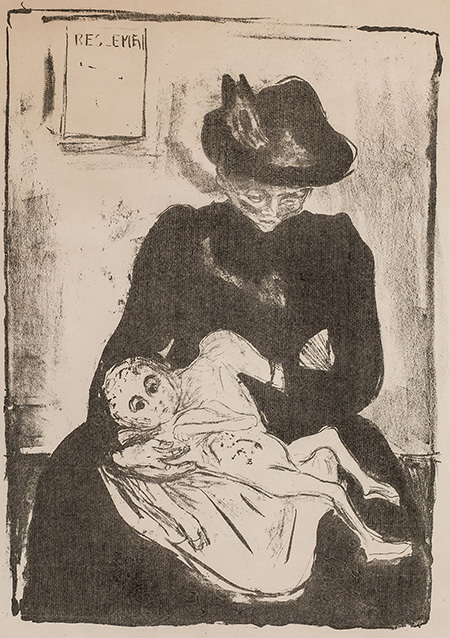 Edvard Munch, "Inheritance," 1916, lithograph, 17 x 12"
You have to be a bit of a treasure hunter to find European modernist prints in Santa Fe. Examples from a private collection fill two small rooms here with a remarkable selection of prints by Pablo Picasso and Edvard Munch. The Southwest is home to a contingent of master printmakers, and to them especially I say: you must see this. The 20 works by Picasso featured in “Genius on Paper” span the Spanish artist’s career as a printmaker. It’s a paper trail that chronicles his visual innovations and tumultuous relationships, his development of a highly personal symbol system and his later struggles with aging and impotence. Some of these works are stepping stones on the path to masterpieces. “Nature morte au compotier,” a drypoint and scraper on laid paper from 1908-9, is the scribbled formula for analytic cubism. “Les Trois Femmes,” a drypoint and etching from 1924-25, is a masterwork in itself, albeit in multiple. “Visage de Marie-Thérèse” a lithograph from 1928, was drawn during the second year of Picasso’s relationship with Marie-Thérèse Walter. It’s a tightly composed portrait that captures a single plane of the muse’s face, a study for the simplified forms that make up his iconic oil paintings of her. Picasso’s materials present a different type of chronicle of the artist’s life. As the years fly by (there are works from every decade, from the 1920’s to the 60’s), his paper selections grow ever more luxurious. There’s Montval laid paper, Auvergne Richard de Bas laid paper and ancient Japon. I’m no paper conservator, but when the creamy, almond hue of a sheet literally makes me hungry, it must be something special. There are only six Munch prints on view, but they are standouts. We’ve entered the second century of Picasso’s crushing notoriety, and even his most daring experiments feel like carefully numbered chapters in your college art history text. Munch’s “The Scream” is also a pervasive image, but it remains almost magically unsettling to the contemporary viewer. A look at Munch’s less familiar images in “Genius on Paper” confirm the Norwegian modernist’s prescience for our near-apocalyptic contemporary tableau. “The Girl at the Window,” a drypoint in brown ink from 1894, is an exquisite light study that communicates utter devastation. In “Study of a Model” (drypoint, also 1894) and “Puberty” (etching, 1902), dark shadows spring from and encroach upon the vulnerable female subjects. “Inheritance” (lithograph, 1916) mirrors a late 1890’s painting of the same title. The work shows a syphilitic mother and her infected newborn, and the image had caused an uproar upon the painting's debut. Munch’s emotional works mark a striking contrast to Picasso’s crisp and ordered folio. Both men were avid innovators in various printmaking mediums, but Munch neither numbered his prints nor spent much time wiping down his plates and stones between pulls. His works are true studies, and there’s a spine tingling sense that they had been recently ripped from the walls of his studio. This exhibition aligns the sort of shining constellation that could pass, quickly and secretly, from one collector’s vault to another. Indeed, there is a private basement gallery here for just such transactions. So it’s a joy that these gems have been placed for a public viewing. The very fact that paper is less precious than oil or pastel diminishes our obligation to feel starstruck or reverent, leaving us freer to analyze daring aesthetic experiments that are laid bare in black-and-white.